HAROM – Human Adverse Reaction Online Monitoring System (One of it’s kind) is the world’s most comprehensive real-time source of ICSRs management and to maintain a continually updated information of ICSRs in more than 150 countries. HAROM provides you a single source to carry out an easy processing and reporting of your ICSRs for legal Pharmacovigilance obligation globally. HAROM has been designed to fasten the process of Case Processing in Pharmacovigilance which helps Pharmaceutical and Clinical Research Organizations to manage ICSRs data from multiple sources, meeting strict global compliance guidelines, and access with ease. HAROM enables end-to-end processing of ICSRs from all sources including automated system, easy reporting and transmission of cases, E2B compliance, and detailed analytics etc. 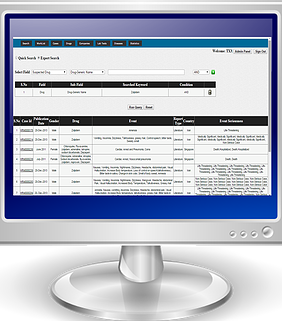 Manage ICSR data from multiple sources like spontaneous, clinical trials, literature, PMS studies, regulatory etc. HAROM has been designed by experts from Pharmacovigilance industry to simplify the process of ICSR data. Improved compliance with cumulative data reviews and analysis. Lowered cost as many manual review and data entry tasks are automated now. Faster processing of cases with full track of misplaced cases which improved the regulatory compliance. Increased case volumes with fewer resources results in increase productivity and the business. Assured quality as automated data entry reduced data entry mistakes.